Motor Launch, Windermere. Oil on card. 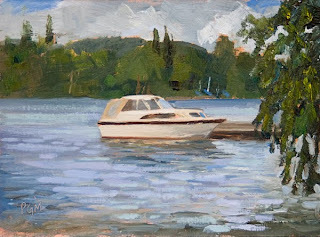 6"x8"
I painted this at a busy location on the shores of lake Windermere. I tend to try to find quieter locations to work but I think it's useful to paint with people around and it's fun to get a response to your work. You still don't see many plein air painters in the UK although I believe this is set to change. I detect a shift away from the artistic preoccupations of the last few decades and a return to what I for one believe are the real issues of painting which are about interpreting the world around us. By that I don't mean politics or social commentaries. Nothing is more guaranteed to become irrelevant than art which focuses on 'issues'. If you don't believe me just look at the explosion of interest in plein air painting in the states which is usually five or ten years ahead of us in most things.